This contemporary Guru Pournima tribute is a collection of favorite commentaries on the Guru-disciple relationship by Ramesh S. Balsekar conversations, letters and poems, each a profound expression of gratitude shared between Guru and disciple in this most divine and mysterious of all relationships. Guru Pournima is a celebration honoring the Guru on the auspicious full moon in July-August in the Indian month of Ashada, dating back to the ancient Indian sage Vyasa, who was born on this day. 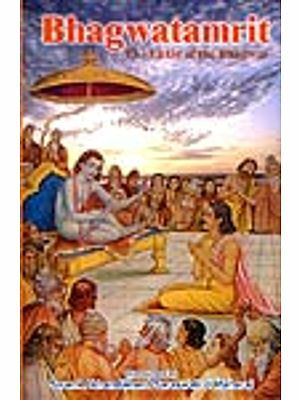 Tradition has it that the disciples of Vyasa asked him for a way to thank him and honor him for all he had given; he suggested that they dedicate the fullest full moon of the year as the Guru’s moon, hence Guru Pournima. 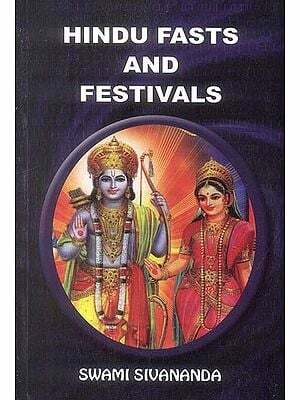 This book is an offering of thankfulness to Ramesh for his modern, eloquent and simple Teachings of Advaita, non-duality. 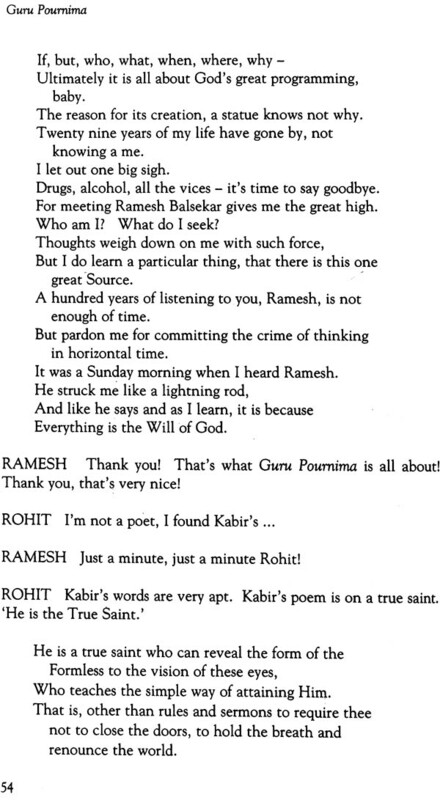 And, it is also yet another gift from Ramesh. His utterly clear Teachings, written and spoken, have touched thousands of seekers from around the world over the past 20 years. This book reflects the experience and outpouring of gratitude of so many seekers who have met and learned from Ramesh through books, letters and satsang. 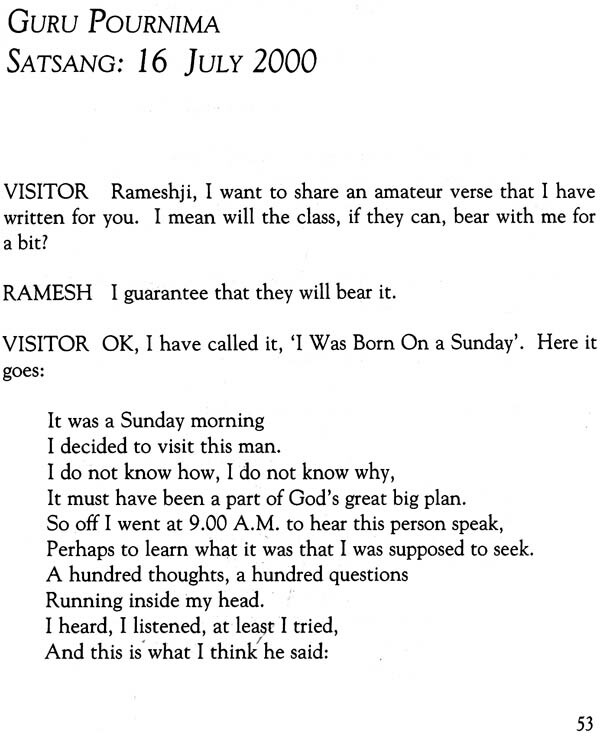 Each format is its own vehicle, and each equally masterful and effective in conveying Ramesh’s timeless message, bringing relief from the suffering of the burden of shame and guilt, hatred and malice, jealousy and envy, which obstructs the peace that is right before us in ordinary daily living. Much has been written about the Guru-disciple relationship and yet it remains one of the most elusive and profound of human connections. We can attempt to describe what this relationship consists of.. we can talk of our feelings in the presence of Ramesh , we can catalog our hopes and desires in relation to Him, we can write poetry, we can compose and sing songs, we can do all this and more and still if the ones to whom we are describing it, have never experienced it..they will never understand it. I have been blessed to know Ramesh both as a man and as my Guru. As a man his qualities of intellectual acuity combined with a fundamental kindness make him acutely aware and tolerant of people and their strengths and weaknesses. His experience in the large organization of the Bank of India has given him an uncanny ability to meet people at the point of their greatest need. And while kind and generous he is nobody's fool. He can cut through insincerity and pretense as if they were tissue paper. His values reflect his age and culture. He is very much an 85-year-old Indian Brahmin and this perspective provides color and vitality to his continually evolving Teaching. But by no means does it limit the scope of his interest and curiosity. He pulls evidence and examples from every imaginable source ... from the ancient scriptures to the most cutting edge of scientific discovery. These qualities combine to make Ramesh an extraordinary man and a truly unique teacher. It is here I make a distinction between teacher and Guru. As a teacher he is able to draw on the wealth of his experience with life and with people as well as his considerable intellect to craft a variety of pointers that he uses to point to that which is beyond all knowing. And out of his infinite compassion for the plight of the seeker he has created a Teaching that is designed to help the seeker in daily life ... to help ease the burden of guilt and shame that makes life so difficult for so many. Of the seekers who meet him either through his writings or by visiting him in his flat in Mumbai, many benefit from his Teachings without ever knowing him as their Guru. Before I speak of the Guru, I must first speak of resonance ... that elusive but potent quality that defines the Guru-disciple relationship. I see resonance as essential to this relationship which is ultimately impersonal from the standpoint of the Guru but that is intensely personal from the standpoint of the disciple. To understand resonance you must first understand that it is formless ... a vibration or energy that is known by what it does as opposed to what it is. 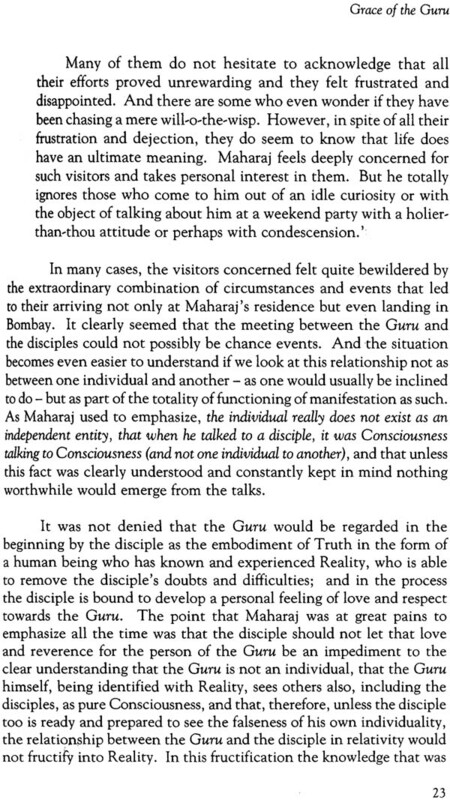 It occurs between two objects ... a disciple object and a Guru object. The disciple is always human but the Guru can be any object. When this quality of resonance occurs between the two objects, the Guru (God, Consciousness, Source) is made experiential for the disciple. 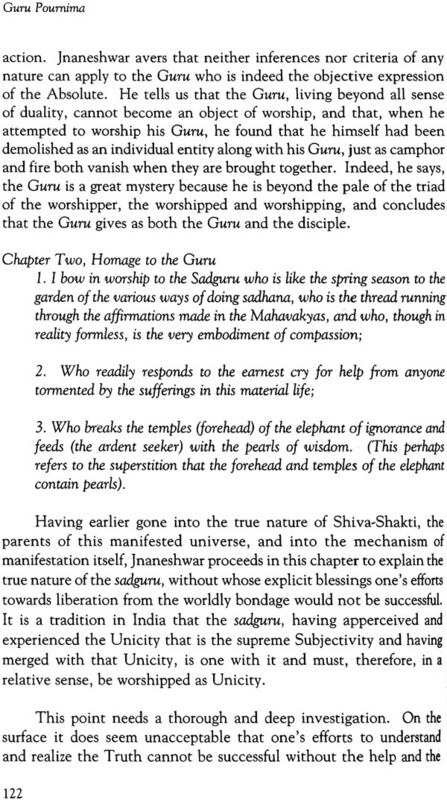 We can say that the Guru arises or is made manifest out of this resonance. How the disciple experiences this is as varied as are the personalities and natures of the disciples themselves. 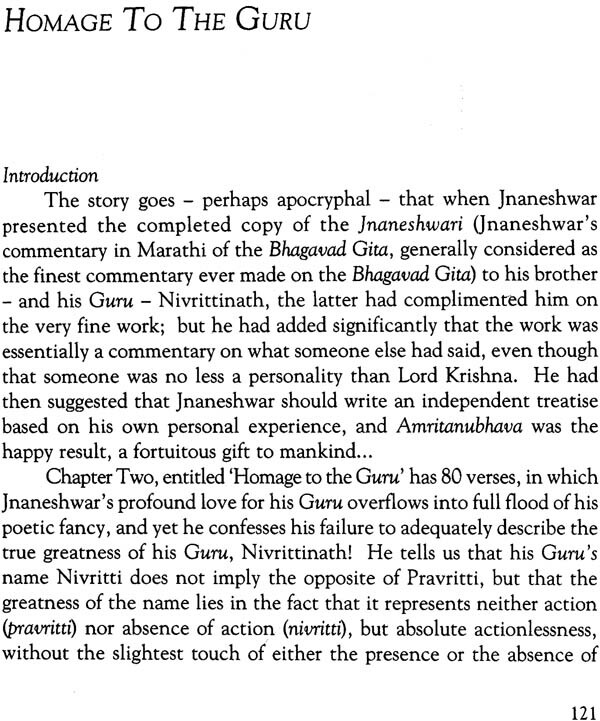 And it is a curious fact that the way this resonance is experienced by a disciple is often in direct contrast to his general nature ... such that disciples who are essentially intellectual by nature suddenly find themselves filled with heart bursting love and that disciples who are usually very emotional may find themselves intensely interested in the structure and content of the Teaching. 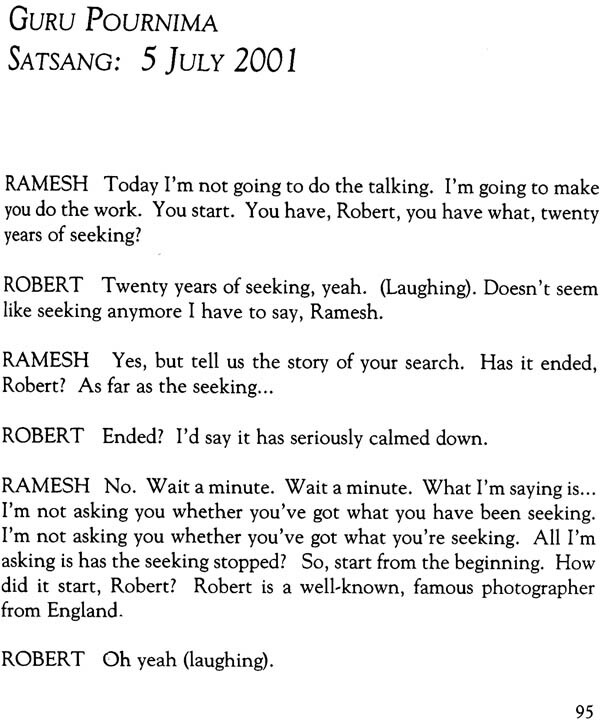 This concept of resonance is useful in explaining how it is possible for you to be so deeply moved by Ramesh's presence and yet when you bring a friend to see him, your friend fidgets and twitches and looks at his watch willing the clock hand to move so that he may be relieved of the torture. 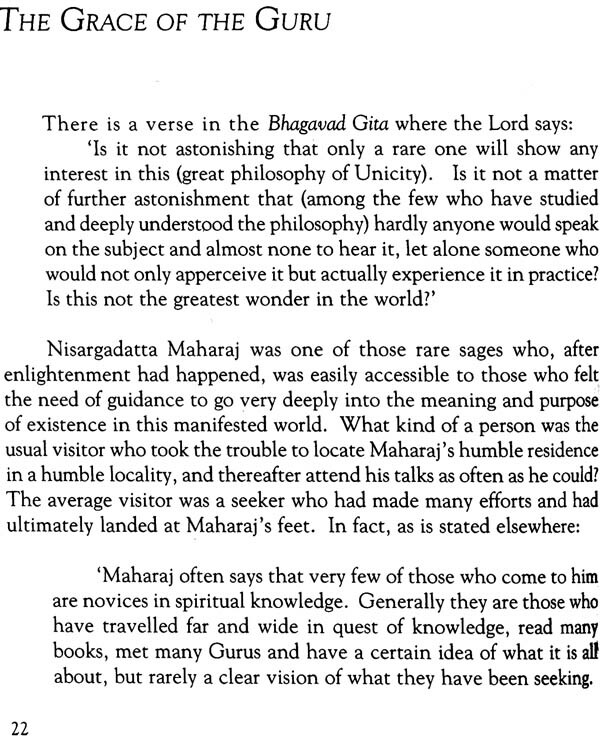 In the absence of resonance there is no experience of guru or Guru. As disciples we delight in the feeling of love we get in relationship to this beloved object. .. this venerated being. He could well have been a mountain or a tree, but how wonderful that he is not. We rejoice in the sense of openness and completeness we experience as we behold Ramesh's loving countenance either live or in a picture or in our memory. When away from him, our hearts soar at the prospect of being with him, our Guru, to once again feel ourselves swept away ... to feel our hearts open, our petty concerns slip away. 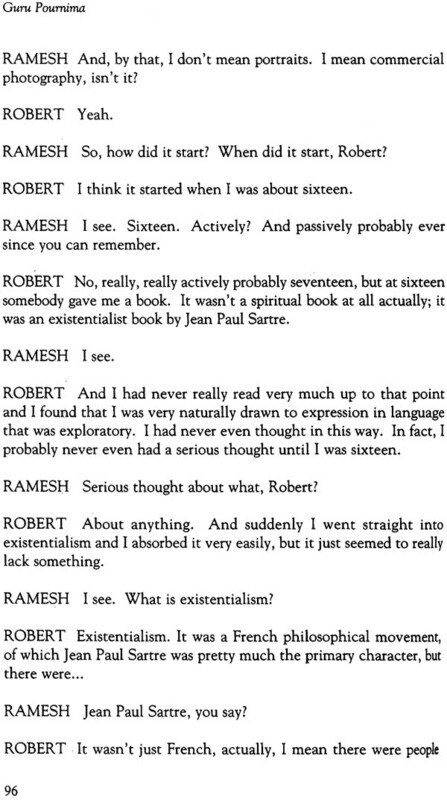 Those of us blessed to have this resonance with Ramesh feel fortunate indeed. When we are at his feet we know beyond doubt that the universe is in perfect order. That regardless of the state of our emotions, health, finances or relationships there is no cause for worry. We are blessed to have a Guru who is at once vibrant, compassionate, humorous, worldly, intelligent and humble. He is for us the perfect combination of qualities ... the complete sage ... our beloved Guru, Ramesh.